City Removals is proud to have so many satisfied customers. Just wanted to say how impressed I was with City Removals. What a great team they were – they provided a very competitive quote and packed everything including a piano very carefully. The packing was done the day before and everything clearly labelled. Anything we wanted kept separate and accessible was done so. Everything arrived the other end on time and in good condition. I have moved 6 times in my life and I have the worse memories; this has been the smoothest moving of my life. The team was on time, polite, careful, considerate. I have no broken items at all. I paid extra £220 because I could not get the van closer than a 100 metres to the flat, but I was advised before booking. I found the packing cost really reasonable (£350), considering the quality of the packaging (every fragile item was wrapped twice), and they had special packaging for the TV and electronics. Worth every penny. I highly recommend it to anyone. We moved houses from one end of London to the otherside - 15 miles apart. The move went extremely smoothly - Adrian and his colleague were brilliant!... the packing was done with great care .. the loading / unloading as well but very efficiently. I was very impressed and happy with the overall way in which both of them worked together... and both were extremely polite. All items came in perfect condition (well so far as we are still unpacking but almost done!)... I dont think there was anything missing in the service.Thanks very much for arranging and making this easy - did take a lot of stress away on the day!. Please pass on my thanks to the two ... they were simply brilliant. I came across this company whilst reading removal reviews.They had the most reviews and were the most highy rated.I am very pleased to endorse that assessment. From the quote(online) through to the site visit and the actual move itself,they were all efficient,professional and friendly. Their quote was a quarter of the price of another quote we had and the cheapest of all five quotes.Whilst this wasnt the main factor,it certainly helped. The removal men on the day worked extremely hard and had to undertake another return trip from london to kent which they did without complaint! An excellent all round service.Cant recommend highly enough. This was a move from London to Kent but the review menu didnt seem to allow me to put in Kent! Extremely good service. We moved from a 4 bedroom flat in Kensington to a 4 bedroom house in Barnet. We went for the full packing and moving service. The move was conducted over 2 days by a 3 men crew on each day. Very polite very hard working guys willing to do anything to keep us happy. The first day was quite long, with the guys finishing around 11PM , but they have done all the packing and more than half of our belongings were moved to the new house. I find it extraordinary how they can work so long and still be cheerful and willing to help. Around 5 PM my wife went and bought some McDonalds for all of them and that was the only proper brake they took all day. The second day was much easier, and they managed to finish by 5PM. Nothing was damaged or stolen. Also we have finished unpacking some of the kitchen boxes , and we were amazed at how much tissue they used. We have around 10 plastic bin bags full of tissue paper so far. Very good and professional service all around. The pre move visit was also done very professional by Nicola(thank you Nicola).She won our trust immediately, and although their price was not the cheapest( I think somewhere in the middle) we decided to go with them. In the end I must say that I would recommend this company to anyone as we were extremely satisfied and happy with the services we received. We used this company for our move from a 3 bed 4th floor flat with no lift in Ealing to a 3 bed house just down the road.Before the move we had 5 different estimators that came and surveyed our house.We than received all the quotes on my e-mail. City removals were somewhere in the mid-price range. We had cheaper but also more expensive prices. Choosing someone was really hard as all the companies seemed to be professional movers with good reviews. After much talking with my wife we decided to use this company as Nicola we think was the most professional and polite from everyone.After we have finally settled down I can say that the service we received was nothing short of perfect.The staff were incredibly polite and hardworking, but also top professionals as they dismantled and then reassembled everything with ease. Their care was also extraordinary throughout the whole move. Also to anyone that is even thinking of packing their belongings themselves….do not do it.I think the best money we have spent was on their packing service.2 men came the day before the move and In about 6 hours they packed everything in boxes. We think this was extraordinary given the amount of staff we had. Also after unpacking my wife has about 20 bin bags full of tissue and bubble wrap, so they did not cut any corners when they packed our stuff.On the move day we had a 4 men crew, I remember all the names(Nick 1 and Nick 2 Adrian and Silvio).They were all extremely hard working, motivated and very careful with everything they touched.The loading took a bit more than expected (around 6 hours) but this only because of the sometimes exaggerated care they take with everything. No complaints here whatsoever.Once at our new house they placed everything in the relevant rooms, rebuild all the furniture and placed all the boxes where we wanted.We were extremely happy with the service we received and we think that although a bit more expensive than other quotes we have received it was money very well spent. We chose this company after a work colleague recommended them, and I am very pleased to say that everything went extremely well. We moved from a 4 bedroom house in KT area just a few streets away. We also had a free property survey before the move and the representative who came over to do the assessment was very polite and professional. After this, in the same day we received the quote on our e-mail. The price, although not the cheapest, we thought was reasonable for the amount of stuff we had. 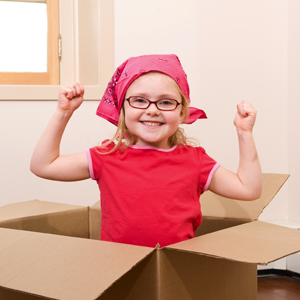 We also choose their packing service as with 3 children it was almost impossible to do it on our own. We had the whole house packed in about 7 hours by 3 of their staff, which we thought was incredible. Everything was packed properly, all the boxes were marked and they took very good care of all our artwork and fragile items in the house. The next day we started early at 07:00 AM and they came right on time. After offering them a cup of tea they started emptying the house. I was happy to see that as explained by the representative from the property survey they used all sorts of furniture covers to protect our stuff. Also every single one of them was extremely polite and hardworking, going out of their way to ensure we were happy with the service. They finished at around 09:00PM at our new house. They placed all items where we wanted and also reassembled our beds and wardrobes. We had many things stacked in the garage as we will be moving again in 6 months’ time. No damages occurred whatsoever during the whole process. Based on our experience with this company I would have no hesitation in recommending their services to anyone. Also i posted this review as i was kindly asked by the company to provide feedback about their services at the end of the job Thanks. City Removals are hard-working and professional and I would recommend them without hesitation. They were on time and cleared out a small, cluttered flat without complaining. Their attitude throughout was excellent and made us feel at ease. Before the move, the people at HQ were very professional in calculating a quote. Price wise they were no more expensive than some other quotes I had. Definitely worth the money. I used City Removals to move the contents of a studio flat in Central London to a 3-bed property in Zone 2. They were also responsible for packing and unpacking. The movers were polite and professional throughout. They pointed out smaller/valuable items that we might want to take ourselves to avoid the risk of loss or damage. They worked quickly and without complaint although the destination property was on the third floor without a lift. Arranging the delivery was also simple, with staff in the office happy to follow up with the Council on parking dispensations. I needed to move the contents of my 2-bed flat in Central London to a similarly sized flat in Beaconsfield, just outside the M25. This was the first time I had ever needed to use a removals company, so didn't really know what to expect, either in terms of price or service. I used a website which sent my details to a number of different removals companies and got quotes back which ranged from £300 to £1300! However, I did a bit of customer research on the companies which quoted, and they were mostly either 'do not use this company', or 'very expensive for what they did'. So I started again, and looked on Removal Reviews for the highest-rated companies. I chose City-Removals and Storage, as they seemed to be highly regarded and I got the sense they were sensibly priced. I requested a quote on their website, and 2 days later their estimator Nicola Antoine came over to do a survey. She was friendly and very professional, and provided me with a quote for the removal itself, with optional pricing for packing, and for packing materials. I chose to do the packing myself and had lots of boxes from previous house-moves, so I only needed to pay City-Removals and Storage £560 for the removal itself, with no VAT to be added. This was a bit more expensive than they would charge for a normal 2-bed flat because I was moving from a 4th floor flat with narrow stairs so they recommended 3 men rather than the normal 2. This seemed a very fair price for the effort involved. So the booking was made, and I paid £70 deposit by bank transfer. They made the arrangements with Westminster Council to suspend the single-yellow line outside my flat, at no additional cost. On removal day, the 3 guys turned up at precisely 8am as booked. They were professionally-presented, wearing company uniforms and in a company van. They proceeded to carry everything down the stairs and into the van, and were very courteous and friendly during the whole process. They put my sofas into big fabric bags, which made handling them much easier - all very impressive. The load-out took just over 2 hours. They then drove directly to the new place, and I met them there. They carried all the items into the new flat, placing furniture and boxes according to where I wanted them - and again were very friendly and helpful, suggesting the best locations for things in the rooms where I wasn't quite certain. The load-in took a little over an hour, so altogether they completed the entire job in 4 hours 40 minutes including the journey. I have to say I was very impressed with the whole job. There was absolutely no damage at all, to furniture or walls. They were careful to avoid getting muddy footprints on the carpets. They even brought their own bottles of water so I didn't need to provide them with tea! I would definitely recommend this company. I wanted to say how pleased I was with the service provided by City Removals. The guys who assisted us could not have been more efficient and helpful. Everything was carefully loaded into one van and put in the correct rooms at the other side. They were extremely firendly and careful with our belongings. I would most definitely recommend them. Having read lots of horror stories about problems people have had City Removals were a pleasure to use. Hi was highly pleased with the service. I used a man with a van previously and was very disappointed that's why I decided to contact professionals. I had read great reviews about City removals and was extremely pleased with the level of service. The 2 guys were very efficient, quick, polite, nice and very cautious with all my boxes and furniture. I will definitely contact them again for my next move and highly recommend them. I hired the services of City removals after finding them online and reading the reviews. The service from start to end was professional and Nicola was always on hand to advice and help, even when we had to change the moving date 3 times. The prices are very competitive and the best money we could have spent to make our house completion day as stress free as possible. The removal team are very courteous and polite and removed their shoes in both properties to protect the floor when requested. My only advice for future potential customers is if you have valuable paintings and artwork, it's important to remain in the room with the packers to ensure that they are all packaged correctly. They will assume that only large pictures are actually valuable and smaller ones are not so. I would certainly use their services again and recommend them to my friends and family. To add to their efficiency, City removals returned to collect all the flat pack boxes and packaging materials for recycling. Many thanks City removals. The two men came to move us from our one bedroom flat on the 3rd floor with no lift - they packed everything so carefully, not one item was broken, andworked tirelessy until the whole move was done. They were unfailingly polite and I would definitely use them again. The packing service was a bargain when I think how long it would have taken us, as well as having to pay for the packing materials, and they did a much better job then I ever would have done myself - and I'm quite pernickety! City Removals did a great job. I used the packing service so they packed every single thing away for me. Even small items that I hadn't bothered to move yet like papers/mail etc. Moved everything in no time and really took the stress out of what normally is a very stressful day. Total cost for move plus packing and recycling a few large items: £456.60 Nothing damaged or missing. I usually don't write reviews but have to this time, as I have been truly impressed by City Removals from beginning to end, and I want to make sure this company get the credit they deserve, as I have been moving 10 times in the last 15 years, in many different countries, and have never come across such a high-quality and professional company, and for a very fair and reasonnable price. First the survey was done very quickly and professionally, which was a great sign. I then received a very competitive quote in just a few days, followed by the boxes I had ordered shortly thereafter, so I could begin packing. Email communication with City Removals was very very efficient and professional, especially when confirming dates, boxes, parking permits, etc... City Removals did take care of all the parking requirements with the council, which was a huge relief for me. Every time I tried to call them, especially on Saturdays, they were always available to discuss on the phone, which was very helpful. They also replied to emails quite quickly, and even on weekends and evenings. On the day of the move, the crew did arrive at exactly 7am, not a minute late! The crew was extremely good, very very careful with my belongings, whether fragile or not. They were taking their shoes off every time they got into the house, both at pickup and delivery, and that was without me even asking for it! They were also extremely careful with the walls, and despite the narrow staircase didn't leave a single mark or scuff on any wall! I stayed with them all day and was impressed as they worked really hard and didn't stop much, from 7am until 7pm, given all the stuff that I have (5-bedroom house). A third guy came to help in the middle morning actually, without any extra charge, and stayed until the end of the day, as I had too much stuff, which was another great relief. Another great favour they did for me is to accept to drive to a storage facility in Wandsworth to drop off several bulky pieces of furniture which wouldn't fit in the new house. It did take a good hour out of the way but they helped without any issue whatsoever. I paid extra for the wrapping of those pieces of furniture but they were well wrapped and they even gave me a few blankets to protect the furniture under the wrapping. I was also quite impressed at how good they were at dismantling the furniture (and re-assembling it) and emptying the dressers of drawers (and anything left) to avoid any movement. At the end of the day, they finished with the patio furniture under the rain, which was a testament to how dedicated they were. They left past 7pm without ever complaining about the amount of work (we did three trips! ), so they deserved a big tip! Another nice gesture was that they took the boxes I didn't use, and I didn't have to pay for them. A few days ago, they contacted me to ask me when they could come to pick up the empty boxes, which was a surprise but certainly a good one, as moving companies don't usually do this or don't follow up proatively about this. For all those reasons, I cannot recommend this company enough! I am not planning to move again anytime soon, but if I do, I know whom to call. I selected City remover and Storage based on the feedback on the Internet from previous customers. The service from the time of requesting a quote to the time of arriving at our new home was excellent. I would highly recommend them if you are considering moving. We packed our own boxes but even then the Removal men used protected covers for all the large items. You won't be disappointed. These guys did a great job from start to finish. The initial communication was prompt and polite, the quote was competitive, the service itself was punctual, friendly and efficient, and all in all I was extremely happy with the end result. Recommended. I am writing this last sentence as apparently you are not allowed to submit reviews of less than 380 characters......OK, I have just tried again and apparently I am stilll short of the minimum word limit. Very very good service. We booked this firm after being impressed by the reviews we read on this website. We had a visit from Nicola who surveyed our property and explained the whole process to us. Very nice person to deal with. Because we also wanted the packing service she advised that the whole move should be over 2 days, as we had quite a lot of stuff. Everything she said they will do happened in the actual move day. They used professional covers for our sofas and all our mattresses. The guy who was packing our kitchen was also a pleasure to deal with and he has done a very professional job in packing our breakables. The only complain here is that he used too much tissue and bubble wrap. After unpacking I literally ended up with about 30 bin bags full of tissue. So ,In the first day a 5 men crew came and packed everything in record time and in the same day they also loaded and moved a bit more than half of everything we had. They were all very polite and knew what they were doing. Very organized. They also did all the dismantling apart from our beds which we still needed overnight. The next day only a 3 men crew came back as there was not too much left. Again they did a very good job. They also reassembled all our beds and wardrobes in our new house. So I would wholeheartedly recommend this company. We felt looked after every step of the way and our move was done expertly. I cannot compare this service with others as we have not moved before , but to me it seemed perfect. Thank you to Nicola and to all the guys involved in our move. Thank you. Was moving within the same block. Arrived just prior to the scheduled time, finished promptly and everything was moved as requested. Very satisfied with the service & recommended. We lived in a large studio flat and had a LOT of stuff to move to our new place. The City Removal quote was by far the most competitive and the two guys arrived early on the day. They worked incredibly hard and we didnt have to lift a finger. They dismantled a large IKEA storage unit, took the arms off our sofa and took the feet off our armchairs so they would fit through the front door of the new flat. They then rebuilt everything in record time. They were polite, friendly and didnt stop until they were done. This was by far the best-value part of the whole moving process and I will definitely use City Removals again. Our team of guys turned up an hour early as we were still taping up boxes. They were everso friendly and helpful and swiftly cleared the flat and were ready to go in under 2 hours. On arrival at the other end the guys unpacked as swiftly as they packed up - with care to not make any mess (it was raining out side and brand new carpets throughout!) but there was no dirt at all! Couldn't recommend this firm enough. Highly competitive price and faultless service. Well done to City Removals! Will be using them again in 6-12 months when we do it all again! From the first contact until their crew left our house everything impressed us. Firstly a very nice lady, called Nicola came and saw our house. We had a good old chat and she responded to all our queries professionally.We also took their packing service as my husband works and I am very busy with our 13 months old daughter. When the guys came I found them to be very polite and considerate towards our requirements. I have asked them to take their shoes off and this was done without any complaints. The packing service was done very professional and quite fast. It took them about 5 hours to pack all of our house. They also labelled all the boxes and did some dismantling to save some time on the move day.The following day , the same crew came which was reassuring as I already knew them. They also used furniture covers for our two sofas, armchair and all the bed mattresses, just like Nicola explained.Once at our new house , again I have asked them to take their shoes off as we had new carpets and it was done without any complaints. I have also asked them to assemble my daughter’s cot before 07:00 PM (so I can put her to sleep)and they did.The whole process was smooth and stress free. Everything was done professionally and we felt very well looked after by both the office staff and the crew that did our move. Our experience with City Removals was exceptional, from quote through to removal. Nicola visited our property to assess the items that were being moved and transport/resource requirements. She was professional, very clear, and answered all questions honestly. The quote for the job was promptly provided. It was neither the cheapest nor the most expensive quote we received. £1200 to move the contents of a three bed house from London to Kent, including a piano that needed to be placed upstairs in the new house. This price also included a full packing service. Our decision to use City Removals was based partially on the quote (price and professional nature of the assessment and presentation), but also on account of excellent reviews on the internet. Our move was complex. We started with a quote for removal over a single day, but this quickly morphed into two removals; half of the move took place in early December, and half in early February. City Removals was most understanding about the changing requirements and provided additional quotes on this new basis, and a further quote for the removal of additional items. We ended up with a price of £1450, which reflected two moves rather than one, and included an amplifier and washing machine that weren't initially included in the quote. The delivery team turned up on time for both removals, and was absolutely brilliant. Friendly, professional and hard-working. Goods were well packaged in clearly marked boxes, loaded with care, and unloaded in the correct room at the new property. The team clearly took pride in its work and provided excellent service with minimum fuss. I can't say enough good things about this company, and I'd recommend them without a moment's hesitation. We have moved from a 2 bedroom flat on a second floor with no lift to a house. I have used City removals after a work colleague highly recommended them to me. I asked for a site survey before the move and 2 days later someone came and saw our property. I was a bit worried as we also have a 10 month old baby and we just wanted to move without any hassle or problems. The lady who did the site survey answered all our concerns and they also kept all the promises that she made on the move day. Firstly a team of 2 men came and packed our flat and also loaded the boxes and some of the furniture in the truck , which was impressive. I think that the whole packing took them around 4 hours. Also I have watched the guy who was packing the kitchen and he was really doing a good job. I think my wife unpacked about 12 bags of tissue only from the kitchen boxes. On the second day 3 men came and in about 4 hours we were ready to go. By 07:00 PM everything was in our new house. They also assembled the cot and our bed just in time for my wife to put the baby to sleep. Also all the men spoke good English, were overly polite and hard working. We are very happy with the services we received from this company and would surely recommend them to anyone. I used City Removals when moving from a shared house to a flat and taking a large bed, chest of drawers, two side tables and a big TV plus over a dozen large boxes. They arrived promptly at 7am, had everything in the van by 7:30, crossed London, and had the furniture and boxes in place at the new flat by 9am. By far the least stressful move I've ever experienced. In addition, the head office were very helpful when answering my questions prior to the move, nothing was too much trouble. I highly recommend them. I have used this company yesterday for my flat move. Chose them after reading impressive reviews about them on this website. They came early in the morning and firstly packed up everything in my flat. This took them about 3 hours and then another 3 hours to load everything in the truck. They were very professional in everything they have done and took very good care of all my stuff. I did not have that much furniture but a standard 2 bedroom flat. Also they assembled a double bed for me which was just delivered at the new flat, which was very nice from them. Very hard working and polite staff. All of them spoke good English and were very responsive to all my queries. So, cannot fault the service provided and would definitely use again and recommend to others.Thanks. The most professional firm we have ever dealt with. Before the move they sent someone to do a free home survey, which was very reassuring. A very nice lady, Nicola, came and saw our house. In a few hours’ time we got a quote via e-mail, which was more than reasonable. It was not the cheapest and also not the most expensive, but the fact that they came to see our house (very few companies agreed to this) and also the positive reviews we read on this website made u`s to accept their quote. On the actual move day the staff was very polite, professional and accommodating. We could not have asked for more. Everything went smoothly to the end. Also they expertly dismantled quite a lot of our furniture and reassembled it in our new house. They used covers for a lot of our furniture which was very nice to see (I have made some pictures and will post soon). So nothing bad to say about this lot and would recommend without hesitation. Thanks.